Deirdre Cartwright guitar, Baluji Shrivastav sitar, Alison Rayner bass, Linda Shanovitch vocals, percussion, Yosuf Ali Khan tabla . Firmly established in the Hindustani classical tradition he delights in exploring music in all its forms – recently entertaining the world at the closing ceremony of 2012 Paralympic Games with Chris Martin and Coldplay. 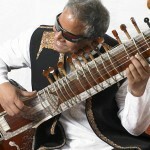 He composes for film, dance, theatre and original works for Western orchestra and Indian ensembles. He has recorded with Massive Attack, Madness, Doves, Amorphous Androgynous, and performing with great artists such as Stevie Wonder. He has his own Jazz ensemble Jazz Orient/Re-Orient and has recorded several albums. jazz to dubstep, punk to folk, spoken word to bossa nova. Singer/Sitarist/Composer Shama weaves stories that start life as poems and take flight as songs. The album features musicians from Bengal, Britain and around the world, recorded in support from Gabriel Prokofiev’s Non-Classical studios. It is already garnering praise from the likes of Gilles Peterson. The sitar is played in the context of storytelling, musically arranged to sit within layered harmonies and complex grooves of a 4-piece band. Expect a performance of challenging musical beauty.